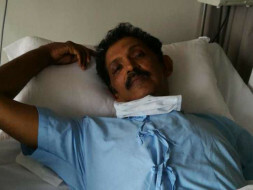 I am Antony Konnel from Bangalore making an appeal to save the life of my co-brother Tomson Varghese. Tomson is 52 years old, married & has 2 children. He had been diagnosed with decompensated chronic liver disease about a year ago. He's a teetotaller who doesn't smoke nor consume liquor. His mother died of same ailment about 4 years ago. 4 among the 5 brother's are now diagnosed with this disease but Mr.Tomson is very critical & needs immediate liver transplant to be saved. (His younger brother Jagan Varghese succumbed to the same disease on 7th of April 2018). His wife can't afford this costly medical treatment with her meagre income of Rs.8000/= per month. Tomson is a freelance writer, writing for local magazines, TV shows etc.,to earn a living. He's been the sole earning member of his family but due to his failing health conditions in the last 1 year his wife Jeraldin Tomson took up a small time job as a receptionist of a dentist to support the family. His son is a 19 year student of a reputed National institute (NIFT), a seat he secured by a top national rank last year. His daughter is a 10th std.student. The family in the last 1 year has spent almost close to Rs.10 lakhs all funded by friends & relatives but now the doctor's have advised immediate liver transplant to save his life. Dr.Cyriac Philips, consultant Hepatology of Ernakulam Medical centre hospital, Kochi advised liver transplant & referred him to Aster Medcity hospital, Kochi as the best equipped to carry out the same. He even gave an appeal letter seeking public support to the family to raise Rs.25 lakhs. 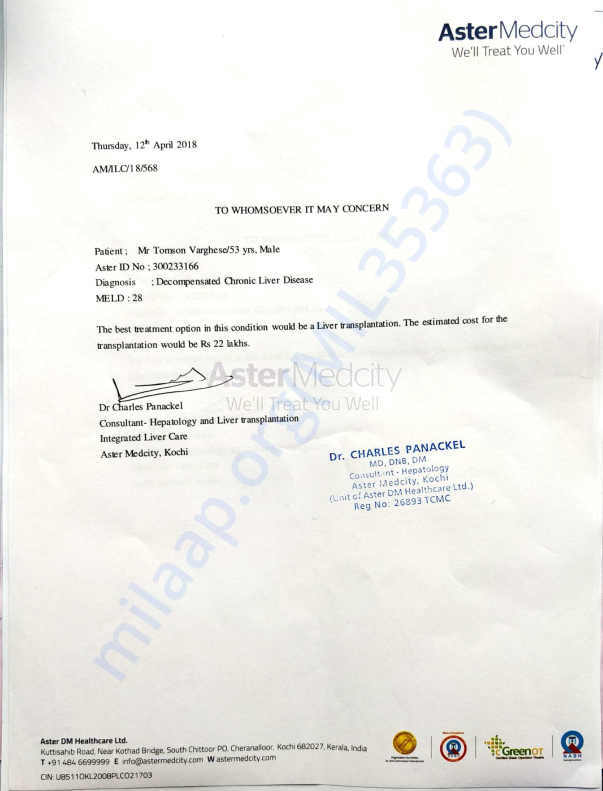 Dr.Charles Panackel, Consultant Hematology at Aster Medcity has also given an estimate of Rs.22 lakhs & requested for early transplant. The hospital bills for the last 1 week touched Rs.3 lakhs. Mrs.Jeraldin Tomson is donating the liver as we couldn't find a matching external donor & also because the family couldn't afford it too. Tomson has been discharged from hospital today (17/04/2018) & instructed to return as soon as the full amount is ready (within 2 to 4 weeks). This is Antony K S, co-brother of Mr.Tomson Varghese for whom this fund raising was done in the month of April 2018 for a liver transplant. 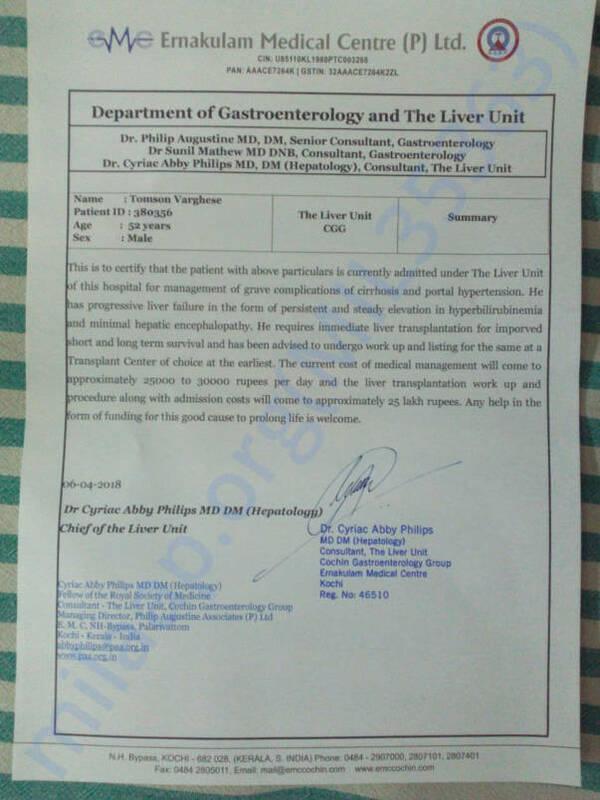 However the liver transplant was postponed initially for lack of funds and subsequently due to improvement in his health condition and also because the doctor's advice to wait for a cadaveric donor. However the family is in tight financial condition owing to him unable to start work. Their elder son is still a student and needs 2 more year's to graduate. The funds will be transferred to his wife's bank account. Thank you all for the support. Mrs.Jeraldin Tomson & her children have expressed their gratitude to each of you who have supported this campaign. Please continue to share this appeal among your friends, relatives. Thank you all once again for the support. God bless each one of you.